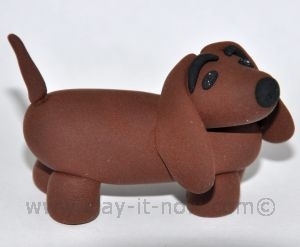 I would give this dachshund figurine to one of our nephews. He used to have a short-legged, long-bodied dog breed called Lulu. She's died about 2 years ago. First of all, condition your clay. Recommended clay would be home-made cold porcelain clay, soapy clay, or salt dough. 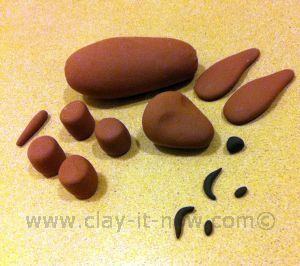 For younger kids, magic clay from Crayola would be best. If you want to make this figurine for cake topper you'll need edible modeling paste such as fondant and edible glue to attach the body parts. Alright! You'll need about 7 to 8 cm elongated oval shape for the body. Roll small tapered sausage shape for tail. Roll a pipe shape of about 7 mm in diameter, 4 cm long. Cut this pipe to four equal length, smooth the cutting edges and let them dry. This would be the dog legs. Roll 2 oval shape and flatten it. The length of the flatten oval shape is about 2 to 3 cm. These are the ears. 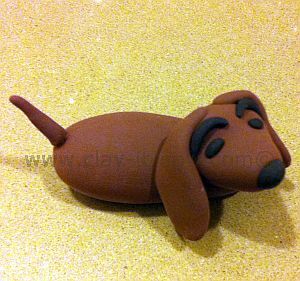 Roll another oval shape clay/ fondant for dog's head. Press this oval shape lightly on your work table and than use your index finger to press the area where you are going to attach the eyes. 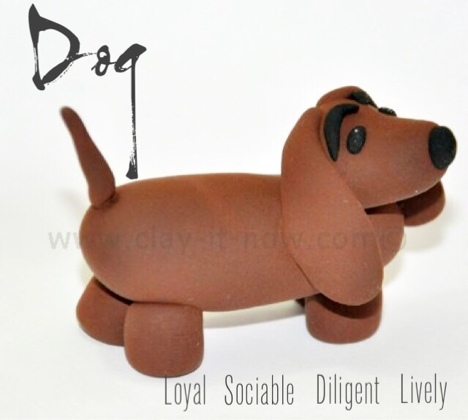 Finally, use black color clay/ fondant to make facial features such as nose, eyebrows and eyes. Attach the eyes, nose, ears and the eyebrows to dog's head. And then, insert the toothpick to the head and the other end to the body. You can add a little bit of white glue if you are working with clay or edible glue if you are working with fondant. Adjust the head position as you like. Finally, add small white dots on the eyes to make it more lively and expressive. After that , attach the tail to the body. To make straight tail, you can wrap the toothpick with clay and insert it to the body. The last step is to attach the legs to the body. Similar with the head, you can add glue and toothpicks to strengthen the legs. By the way, you can adjust the size and shape of the eyebrows and head position for different expression. 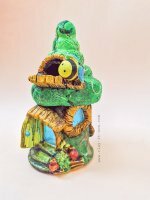 Do you make figurine following tutorial in this page? Did you make your own? Did you collect figurines? We want to see yours. Submit your picture and story to Clayitnow. It will become a new page with your name as an author.